This tour drives overland from Lhasa to Kathmandu across the Himalayas by way of the incredible Arniko Highway that connects Nepal with Tibet. Enjoy fabulous mountain scenery enroute, visit mystical Buddhist monasteries of Tashilungpo at Shigatse, the Kumbum Stupa at Gyantse, and drive past the beautiful Turquoise Lake. In Lhasa visit the famous Potala and Norbulinkha palaces, the great Drepung Monastery and walk through the bustling Barkor Bazaar. Day 04: Drive To Gyantse via Yamdrok Lake. Day 05: Drive To Shigatse. Day 08: Clear the custom formalities and cross border. Welcome to the roof of the world! Your Tibet journey starts with warm greetings from Tibet tour Operator.com with Khaada/Mala/White Scarf from your l tour guide. Khaada is Tibetan traditional welcoming and blessing scarf which consist meaning of good luck. You will be pick up at the airport or train station, then be escorted to your hotel in Lhasa city at the comfort of your own private vehicle. During the hour long drive to your hotel in the city, enjoy the breathtaking view along the Yarlong Tsangpo River. Tibetan features can be seen along the way, including Big Buddha engravings on the hill near the road, colorful prayer flags and friendly Tibetan people. Overnight at Lhasa. After you arrive at your hotel, the rest of the day is free for you to explore around lhasa and acclimatize yourself to this high altitude city at the top of the world. 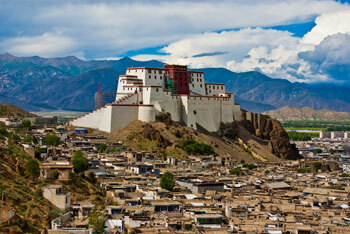 The altitude in Lhasa is about 3,650m above sea level. Today after breakfast you will leave for Gyantse. Enroute you will enjoy the beautiful Scorpion shaped Yamdrok Lake. Before that you will visit the Drolma Lhakang Temple. You will have you best picture shot of Yamdrok lake at the higest alivation enroute to Gyantse, Kampa La above below 4800meters. Yamdrok Lake: After an hour or so driving from Lhasa, you will reach the foothill of Kampa la. From the view point of Kampa La, you will have your best view of Yamdrok Lake. Though you will not see the scorpion shaped lake (view map) but you will see the sky blue water also snow capped in winter. You will drive along the Yamdrok lake for about an hour to Gyantse. On arrival to Gyantse you certain will be tired. Driver and guide will drove you to the hotel where its booked. Take rest and have dinner. Overnight in Gyantse. Today after breakfast, driver will first drop you and the guide at the Kumbum and Pelku Chode. These are the very important sightseeing spots of Gyantse. Kumbum: The first Kumbum was founded in the year 1427 by a Gyantse prince. It has nine lhakangs or levels, is 35 metres (115 ft) high surmounted by a golden dome, and contains 77 chapels which line its walls. Many statues were destroyed during the cultural revolutions and have been replaced by clay images. But it lacks the artistic merits of original. Pelku Chode: Pelku Chode is the Monastery inside the same compound of Kumbum. After finished with sightseeing of Kumbum and Pelku Chode, you will drive to Shigatse. It about 95kms from Gyantse. On arrival to Shigatse you will be driven to Hotel. Oernight in Shigatse. Today after breakfast you will do the sightseeing of Tashilunpo Monastery. Tashlunpo Monastery: Tashilunpo Monastery was founded in 1447 and is the largest Yellow Hat sect monastery in Tibet. Shigaste is Tibets 2nd most important city and Tashilunpo was the seat of the Panchen Lamas. Tashilunpo contains chortens, temples and the Panchen Lama?s palace. At its peak, Tashilunpo had more than 4,000 monks in its 4 monasteries. Upon the death of a Panchen Lama, it was the 4 abbots of these monasteries that would lead the search for his infant reincarnation.The monastery is a striking red, white and black Tibetan structure with a golden roof. Within the monastery there is a 5 story temple, which contains a 26 meters (86ft) sitting statue of the Maitreya Buddha. The statue was cast from 6,700 ounces of gold and over 115,000 kg of copper, making it the biggest copper Buddhist statue in the world. The massive Thangka wall at Tashilunpo can be clearly seen from most points in Shigaste. The wall is used for displaying enormous Thangkas - religious painted banners - for only a few festival days each year. After sightseeing you will drive to Xegar. Overnight in Xegar.